Directional Probes - 2 Dimensional - by United Sensor Corp.
Directional probes are used to measure total and static pressure, yaw and pitch angle, and total temperature. Some United Sensor probes indicate all five qualities. United Sensor two-dimensional probes, indicating flow direction only in a plane perpendicular to the probe axis, have three measuring holes. The center hole indicates pressure P1, and the two side holes indicate pressures P2 and P3. Preferably the probe is rotated until P2 = P3; the flow direction is established as 0° yaw angle and within the probe's limitations P1 indicates total pressure. Because the pressure P2 or P3 is highly sensitive to Mach Number and to small variations in construction, etc., cylindrical (YA) and cobra (CA or CT) probes are not recommended for indicating static pressure. 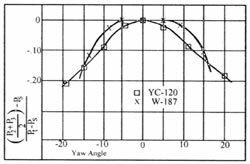 To indicate static pressure as well as total pressure and yaw angle, prism (YC) and wedge (W) probes were developed. These are individually calibrated. Typical calibrations are shown in Fig. 4. 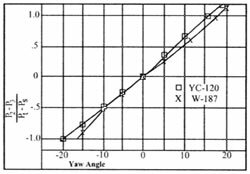 Both the prism and wedge probes can be supplied with a thermocouple to read total temperature, designated as YCT and WT, respectively. A typical installation with manometers is shown in Fig. 1 for a static pressure indicating probe such as the YC or W. For a YA or CA probe the choke and static pressure manometer showing P1 - P23 could be omitted. The choke (USC-8261-3) is not essential, but speeds up the readings considerably. It provides a high resistance bleed across the differential P2 - P3, tapped at the center so that the center tap indicates (P2 + P3)/2.. This average pressure changes only slowly with yaw angle, so P2 and P3 do not need to be exactly equal when the pressures are observed, and the probe can be effectively balanced more quickly. As Fig. 2 shows, the probe sensitivity is such that a yaw angle error of 1° corresponds to a differential P2 - P3 amounting to 5% of Pt - Ps; and if no choke were used, but static pressure taken to be P2 or P3, the static pressure error would be 2-1/2% of Pt - Ps. 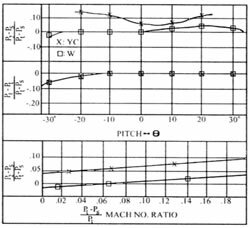 With the use of the choke, the static pressure error at 1° yaw is negligible (Fig. 3). Fig 3. Average static pressure (P2+P3)/2 of YC and W probes versus yaw angle.